If I could give just one piece of advice to anyone planning a trip to Alaska, it would be this, based solely on our first week in British Columbia: Canada is a gorgeous country and should not be overlooked on the journey northward. I believe it would be a mistake to simply rush through Canada and not take the time to appreciate all that the Canadian provinces have to offer. We easily could have spent much more time exploring British Columbia on our way to Prince Rupert to catch the ferry. 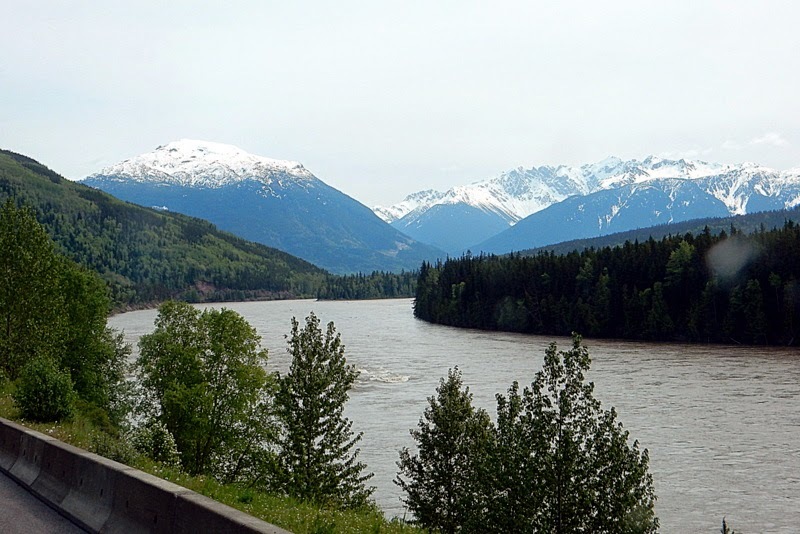 Wednesday’s drive from Tyhee Lake Provincial Park offered a taste of what we will likely see as we journey farther north. 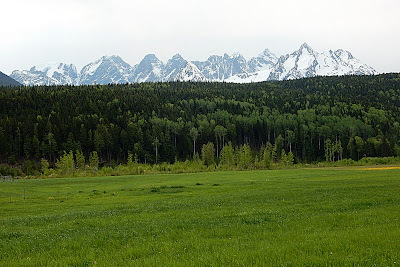 We were surrounded by gorgeous, snow-capped mountains throughout the day. We started out with a view of the Hudson Bay Mountain glacier just west of Smithers, and then circled the Hazelton Mountains and the Seven Sisters peaks. Except for the Seven Sisters, I’m not sure which mountain was which, but enjoyed seeing them all. Unfortunately, the skies were overcast for most of the day, not ideal conditions for photographing snow-covered mountains. It was hard to see where the snow ended and the sky began, but I did the best I could. 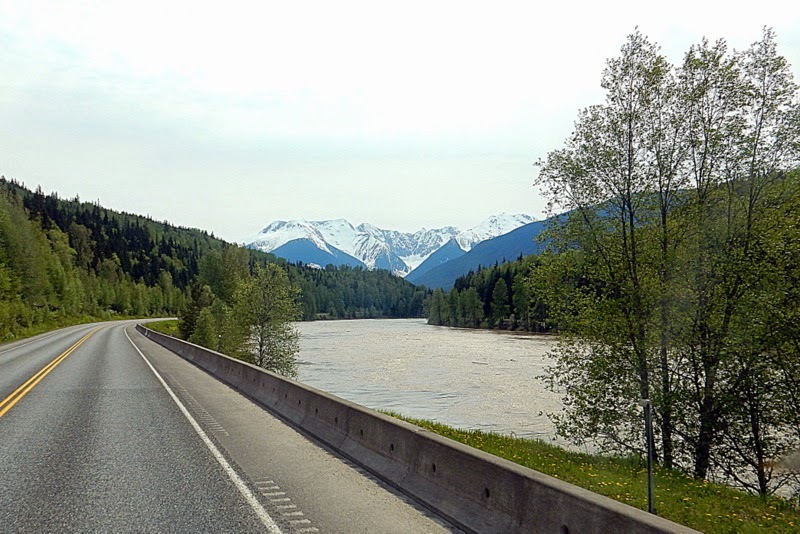 British Columbia has very nice rest areas along its highways, many with beautiful views, and we stopped at one where we met two local women who told us that the best scenery was yet to come. Wow! And to think that we were impressed with what we had already seen. We followed the Skeena River for most of the day, and we noted that it was overflowing its banks. The river was muddy and moving very swiftly. It appears that the warm temperatures have led to a rapid snow melt that is causing flooding. We decided that it might not be wise to camp too close to the river. We stopped in Terrace for the evening at the Ferry Island Campground, a municipal park that reminded me of the provincial park where we stayed on Tuesday. The park contains a nature trail, with a unique twist, that circles most of the island. A local artist has carved figures into many of the trees, and a favorite pastime seems to be trying to find all of the figures. I started out on the trail looking for large ones, and was disappointed not to find a single one. Either I wasn’t looking in the right places or didn’t know what I was looking for. I kept walking and finally spotted a gnome with its own bench. Finally! 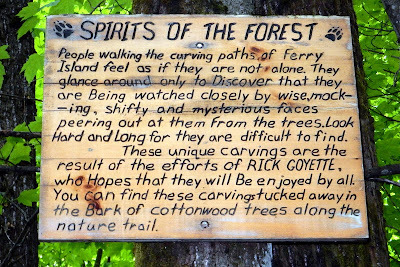 Just then, a couple walking their dog walked by, and I mentioned that I had not found any other carvings. They informed me that the gnome was the exception and that most figures were only several inches in diameter. No wonder I hadn’t seen them. I was looking for the wrong thing. I guess I should have read the sign I photographed more closely! 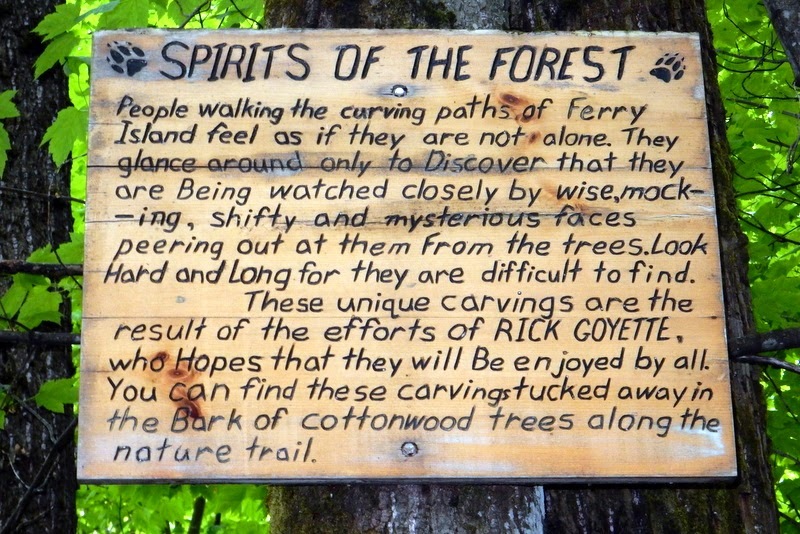 With this new bit of knowledge, I started looking more carefully at each tree and surprised myself by finding quite a few carvings. What fun! 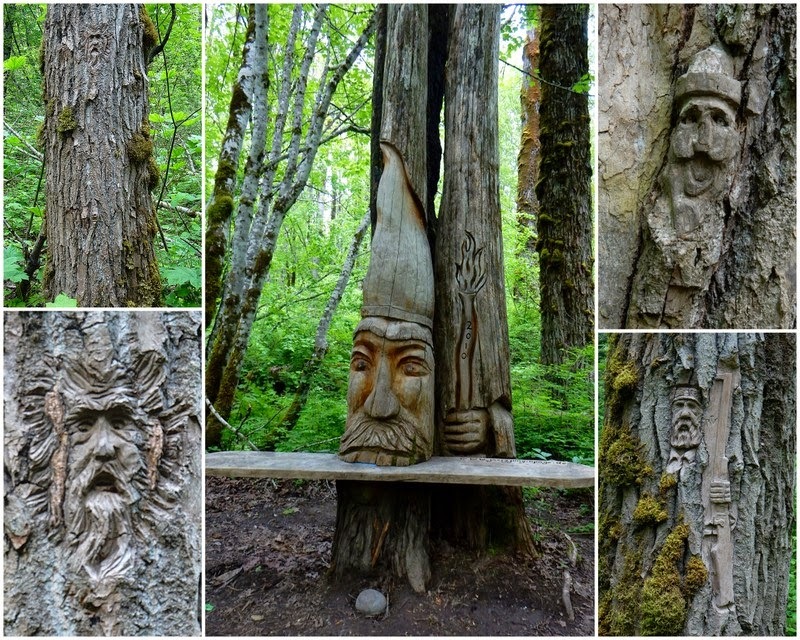 For those who might be concerned that this artistic expression could be harming the trees, I don’t believe the carvings were deep enough to cause any damage. With each passing day and mile, we have noticed that the days are getting considerably longer. It is staying light until almost 10:00 pm, and the sun is up by 5:00 am. Since we don’t have blackout shades in the RV, I have started donning an eye mask when the light wakes me long before it’s time to actually get up. I hope that will work out with the even-longer days that are yet to come. If not, we do have Reflectix sun shades for most of the windows that we could use, the eye mask would be a much simpler solution. I’ll keep you posted. We don’t have a satellite dish for TV reception and instead rely on our bat-wing antenna for over-the-air reception. That has working out well, and Tim has always been surprised by the number of channels that he has been able to pull in, even in far-flung areas. 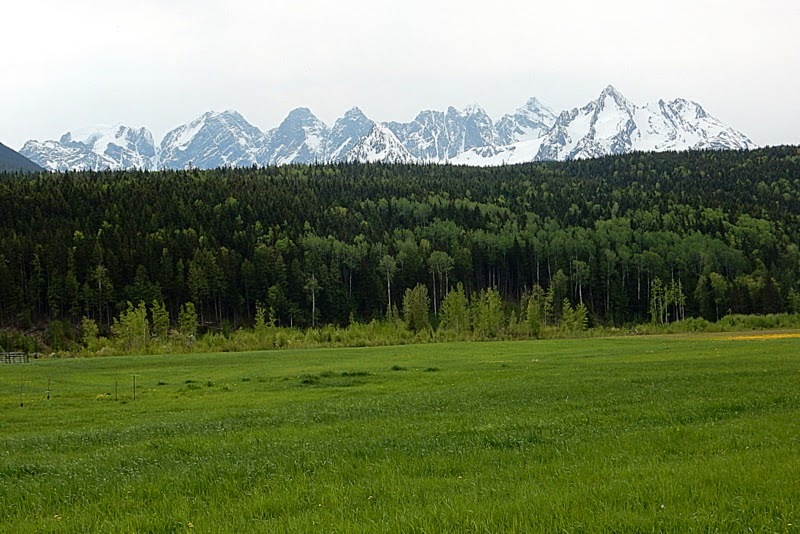 The pickings have been pretty slim in these remote areas of British Columbia, however, and if he does happen to receive a channel or two, it seems that each one is broadcasting hockey. Granted, it is Stanley Cup playoff time, but you know you are in Canada when hockey reigns supreme! BC is beautiful, but I thought the Yukon was even more interesting. Next time I want to spend several weeks in the Yukon. I can't wait to spend some time in the Yukon. It's a place I've never visited. 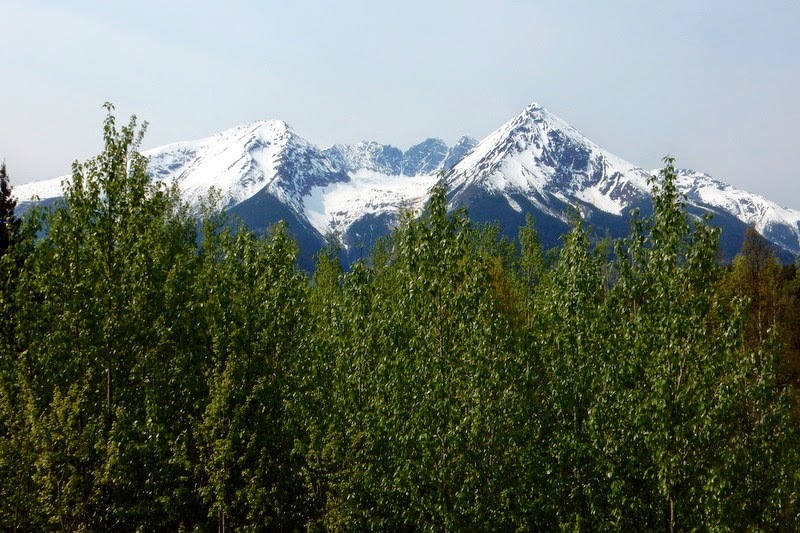 We'll get there when we drive out of Haines in the middle of June, as well as when we return to the US in September. I can only imagine how rugged and gorgeous it must be and hope we'll have time to really appreciate it.